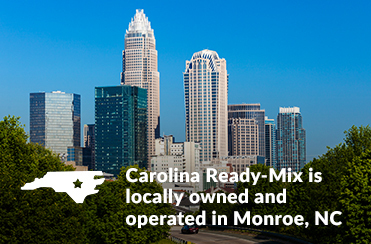 Carolina Ready Mix is a family-owned business that has been serving the greater Charlotte Metro area and surrounding counties (including nearby counties in South Carolina) since 2008. Our customer is our central focus and we take great pride in providing the highest quality product at a competitive price. Our team’s focus is great service, every single day. At Carolina Ready-Mix, you are more than a customer……you’re family. We ensure every yard of concrete delivered is of the highest standard. Our Products – We offer concrete mixes, block and stone, and building materials. In addition to providing ready mix concrete, Carolina Ready-Mix is able to provide many other resources to our customers. Through our sister company Carolina Brick & Materials, we offer many other products with just a simple phone call.